Enrico Castellani ( Castelmassa 1930 – 2017 ) is considered one of the most important figures of European art from the second half of the twentieth century. 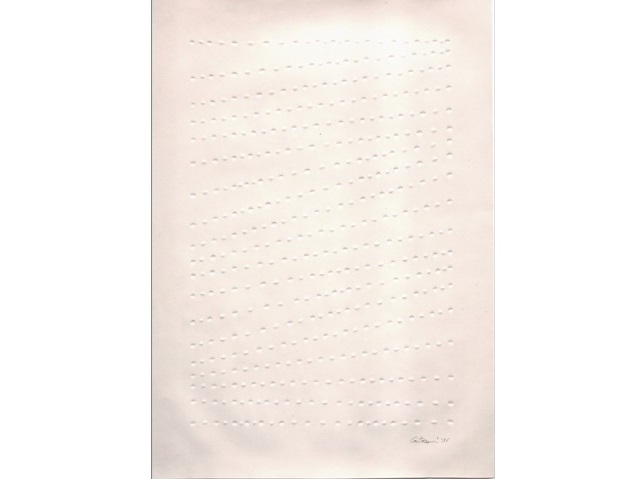 In 1959 Castellani made his first relief surface, giving rise to a line that will be his constant and rigorous stylistic signature and defining what the critics have called “different repetition”, considered by many critics of extreme purity, where the accurate succession of solids and voids given by rhythmic protrusions of the canvas is always a new path, even if it is consistent and intense. From this moment on, his creative process continues to evolve within the extroflexions. Other subjects dear to Castellani are rhythm, time and space that we find in works different from his classic embossed surfaces.